Teaching embroidery to youth and adults alike can be a rewarding experience. If you’ve never taught before, though, it can be frustrating if you don’t plan carefully. Fortunately, two ladies – Joyce Spencer and Deborah Kneen – collaborated on a book that takes you step-by-step through the art of teaching craft, whether it is embroidery or any other crafty thing. If you want to teach embroidery, this book will show you how to get started and how to manage your classroom. The authors explore topics that concern every good teacher. They begin by self-evaluation. Find out what kind of teacher you are, and use your personality to its potential. They also explore the classroom environment. Whether you are planning to teach in a home studio or in a real classroom, they tell you how to make the most of the classroom environment so that you and your students can be comfortable and productive. The authors address the question of professionalism, including questions of ethics, fees, copyright responsibility, and all areas that would concern the professional deportment of a teacher in a classroom. Then they get into the nitty-gritty: developing realistic lesson plans with achievable objectives. I found this chapter the most instructive, since one essential element of really good teaching is preparation. In The Art of Teaching Craft, you get directives on establishing goals, using time wisely, managing different personalities within the classroom, evaluating your lessons, motivating students, and dealing with students who have special needs. The authors discuss different strategies and techniques in teaching and how to effectively implement them. They even address the practical questions of running a business as a teacher of crafts. Throughout the book, blurbs are included from teachers and from students alike, sharing what they like or don’t like about different scenarios often found in art and craft classes and workshops. You’ll find good scenarios – both positive and negative – and feedback on how to correct similar situations that you might come across in your own teaching. If you want to be a teacher – whether you want to teach for profit or for community service – this book will give you all the practical guidelines you need to get started. In the US, you can find The Art of Teaching Craft used through Amazon, often for as little as a penny! You may be able to find it through other used book sources as well. It is out of print, but worth tracking down. Mary, Do you have to be in a guild to teach? I thought that was a requirement? I really wish this book were available at my library. For that matter I wish they would carry more books about embroidery! I would appreciate info on smocking. Esp. for ladies gowns, blouses, etc. Where to buy pleaters. I bought this book after i read your review. I was not at all impressed when i first saw it (esp the cover). But, believe me when i started to read i couldn’t stop until i finished it. 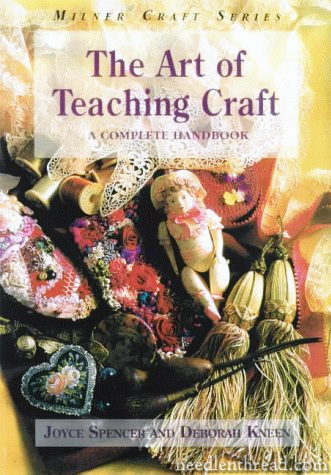 It has some excellent information for people who plan to teach or Are teaching crafts. Some information is related to the 90’s but overall a teacher can get a lot of tips on teaching. It helped me a lot, as a novice in teaching. The saying “Never judge a book by its cover” suits this book! Thanks Mary for reviewing this for us!! !